Who knows what makes mountain climber Alex Honnold – the daredevil at the heart of the so-terrifying-you’ll-hyperventilate ‘Free Solo’ – risk his life thousands of feet up with no ropes or securing gear of any kind. Maybe it’s a quest for perfection, or a death wish, or a unique biological inability to feel fear, or a pursuit of the ‘goddamn warrior spirit’ (his own words). All of these possibilities are suggested during this mesmerising documentary, but you won’t be looking for an explanation. Just like the sheer rock face, El Capitan, that looms like a one-kilometre-tall dare, Honnold himself is a force of nature: shy, prone to solitude and, by his own admission, potentially on the autism spectrum. He studies the complex moves in his climbing journal and waits for the right moment to head out, and up. 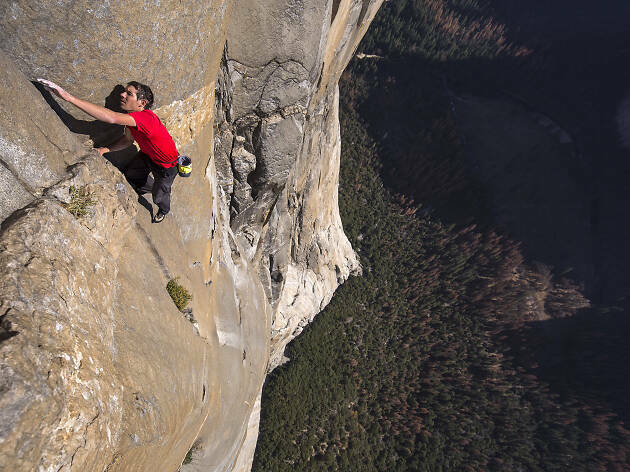 Already a gripping watch, ‘Free Solo’ becomes extra special when it widens out to accommodate the people hanging on to Honnold’s vertical trajectory. We see him transition living in a van practising pull-ups to settling down with a doting girlfriend. Sanni McCandless takes huge emotional risks in getting close to Alex, who might die because of a single misstep, but his evolution through their relationship is heart-meltingly romantic – and ominous. Will it destroy his concentration? Meanwhile, a crew of rappelling cameramen, led by co-director Jimmy Chin, wrestles with its own ethical questions. Are they enabling decisions that could result in a fatality, all for the sake of a movie? 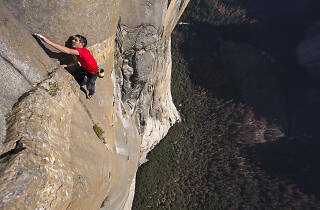 ‘Free Solo’ is about getting dangerously close to the edge, where some people feel most alive. We get to experience that thrill second-hand, and that’s enough. This is an absolutely incredible piece of documentary movie-making. Seriously classy, utterly fascinating & completely involving, don't think you have to have any interest in or knowledge of rock-climbing to get something out of watching this gloriously nerve-shredding film. Following climber Alex Honnold as he grapples both literally and figuratively with the concept of free climbing the infamous 3,000-foot vertical rock face of El Capitan in Yosemite National Park. Captured primarily by friend, fellow climber & film-maker Jimmy Chin, this is a climbing film that's not really about climbing in the same way that 'Jaws' is not really a film about a shark. This is a study of one man's limits and how far he's willing to push them, of what he's trying to escape and make up for, of how he learns to have a relationship at the same time as tackling his ambitions and what happens when you can - and cannot - do all of these things. Plus, he eats chilli like no-one I've ever seen in my life...someone, please, get this man a set of cutlery. If you're that sort of person, you may find you'll leave the cinema and want to hit up your nearest rock climbing centre. I'm not...but I am the sort of person who finds complete inspiration in the stories of other people working to be the very best in their field of expertise and that might be just why I found Alex and his story so mesmerising. He's not a perfect person - are any of us? - but he has a fire within him that those who are never satisfied with being just good enough will recognise. Oh and there are also enough vertical camera shots in this to make the hardiest of stomachs drop away at the thought of trying to scale them free of ropes and harnesses; the moments where he is literally hanging on by the tip of a finger or the wedging in of a small toe are more thrilling than any popcorn summer blockbuster that Hollywood can dream up. If reality TV that challenges & inspires rather than revolts & bemuses floats your boat, this is one work of art worth seeking out asap.